Just like any type of pool, inground vinyl liner swimming pools need to be maintained and cared for all the time. Eventually there will be a time when your inground swimming pool vinyl liner will need to be replaced or renovated. 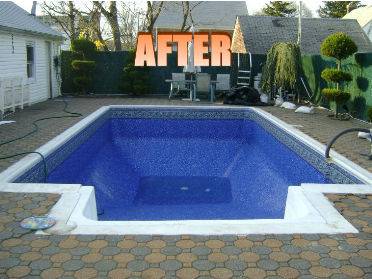 Our vinyl liner pool renovations and restorations will make your pool and feel like new again.A bonus to renovating your existing vinyl liner pool is that today there is a large selection of colors and patterns available for your swimming pool liner replacement. You can choose an exact liner replacement or you can go with a different color or pattern to make it fell like a whole new swimming pool. No matter what style swimming pool vinyl liner you decide on, our professional liner pool renovation specialists will make sure your swimming pool is beautiful and clean again in a very short amount of time. You can check Liner Selection section at our website to see some of the colors and styles of vinyl liners available. We can help you decide on the right vinyl liner for your pool. Our vinyl liner installation experts can answer all questions you may have about replacing your pool liner. Below you can see how our inground swimming pool liner replacement, in ground swimming pool liner renovation process works. Our liner replacement team will measure your swimming pool and order liner accordingly. Then we receive your in-ground swimming liner from the factory in about 2 weeks. When we receive the in ground swimming pool liner, we drain the swimming pool water out, remove existing in-ground swimming pool liner and clean the swimming pool. Before the pool liner installation, we inspect swimming pool wall and floor. If there are any minor work that has to be done, we take care of it without charge. Before installing your swimming pool liner, pool wall has to be smooth and clean. If needed, we prefer installing wall foam. When we install new swimming pool liner, we replace pool gaskets for the main drain, pool skimmers, swimming pool light and swimming pool returns. Replacing those from old swimming pool before liner replacement or liner renovation will be safer. If existing inground swimming pool skimmers, pool light and pool face place seems old, we replace them for a reasonable price. Our in-ground swimming pool liner installation fit perfectly to your pool. We provide %100 customer satisfaction. Blue Dream Pool has offer professional in-ground pool liner replacement. Flemington, Clinton, Edison, Bridgewater, Lebanon, Frenchtown, Pittstown, Princeton, Alexandria Township, Ringoes, Pennington, Bergen County, Warren County, Hunterdon County and surrounding areas are our service areas in New Jersey. Also Lehigh Valley, Allentown, Bethlehem, Easton, Bucks County, Lehigh County, New Hope and surrounding areas at Eastern PA. Blue Dream Pool offers a variety of high quality pool liner. Our professional installation team will leave your pool looking perfect and leak-free for long time to come. Although, our professional team can measure your liner before pool drained, it is always best to drain your swimming pool completely to begin the measuring process. It is important step to measure pool liner by professional company to determine corner radius and depth, slopes factors. That way, you swimming pool liner will fit exactly to your pool. 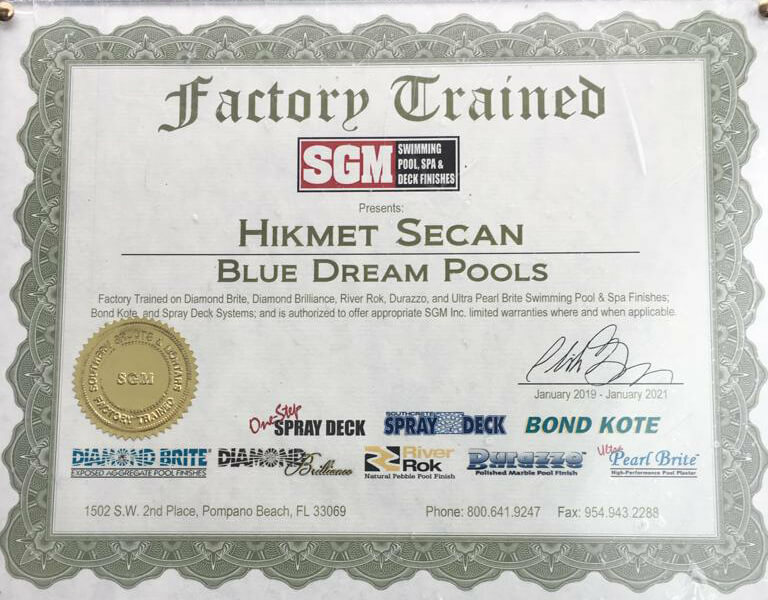 Once all measurements are complete by Blue Dream Pool profession, your selected liner will be available for your swimming pool to installation. Blue Dream Pool in-ground liner replacement team will install your new liner. Blue Dream Pool team will cut your old liner into strips, rolled pieces up, remove and properly dispose old pieces. Old liner will be cut along your pool wall and it will be cut around gaskets and fitting that will be removed later. It is always good to check underneath them to see if there may any excess bits of liner that must be cleaned out. 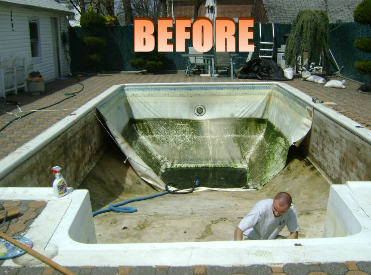 When your old liner is completely removed our liner replacement team will determine the condition of your pool walls and floor. Blue Dream Pool team will check to see if there are any cracks, rust or holes. If anything is wrong, it must be repaired before installing your new pool liner. Before liner replacement, our team also will check to see if there is any stone, debris or sand. All dirt has to be completely removed and every inches of your pool floor needs to be cleaned meticulously before liner replacement. Pool walls have to be checked carefully against seams and sharp edges of pool shell. It must be treating with duck tape. If pool walls are splintered or rusty, protective wall foam must be used. Liner replacement should be done in temperature at least 70 degrees F. Below temperatures make liner replacement harder. For that reason, it is always best to install liner in sunny weather. Following markers on the liner, placement should be done from shallow end to avoid making any marks on the bottom of the pool to the deep end. Because of the size and weight, liner replacement and liner installation process generally takes a minimum 2-3 people. When the liner installed properly and placed into the track all the way around the pool, all air that stays under the liner has to be removed by using vacuum. That will help to create an airtight seal between pool liner and wall. When Blue Dream Pool team completely installed your new pool liner, it is time to fill your pool with fresh water carefully. Most important thing when the water fills is leaving vacuum on. That means, vacuum has to be turned on and continue to work while filling process goes on. This process is extremely important and has to be handled by a professional team to avoid any sliding or shifting of your new pool liner. Watch water level until it reaches about 12 to 16 inches above the pool surface of the shallow end. Then, you can shut the vacuum off. Water filling process can continue to the surface. When filling completed, your water must be tested and treated accordingly. After all this, you new pool liner will be ready to use.